PR pros everywhere are eagerly awaiting to receive their ordered copies of the 2013 edition of the AP Stylebook as our handy dandy guide, often referred to as the "Journalist's Bible," was released today. 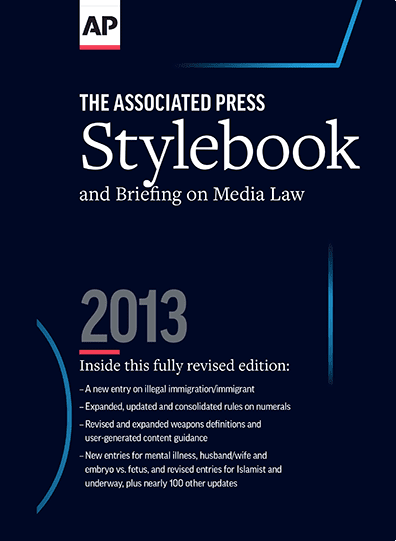 In celebration of the 60th anniversary of the AP Stylebook, this latest edition includes nearly 100 new or updated entries, along with an expanded chapter on social media. Some of the new additions are in sections on food, fashion, numerals and weapons. There are others on mental illness and illegal immigration. Among word-specific new and revised entries are Advent, Alaska Native, Asperger’s syndrome, athletic trainers, disabled/handicapped, doughnut, dumpster, ethnic cleansing, homicide/murder/manslaughter, moped, populist, rack/wrack, red carpet, swag, underway, wacky and wildfires. All in all, the spiral-bound version comes in at 510 pages.